Below find two draft itineraries for Damavand ski touring. You may make some changes to best suit your plan. It is a very good idea to have extra days for bad weather and more acclimatization. More details in Damavand Ski Itinerary. If you need some advice in this regard please let us know some information about your program to discuss more details. To offer you a practical itinerary it is appreciated to give us some idea about your ski mountaineering experience, your physical fitness, timing, number of days in your itinerary, exact number of participants in your team, starting date and all the necessary services and logistic you need.Then we may offer you a custom designed ski touring programs for Mt Damavand Iran based on the provided information. (The recommended starting days is Saturday). Visit also Crowd and Iran Holidays. Day 2: Transfer from Tehran hotel to Camp 1 Polour (altitude 2270 m). O/N C1. Day 3: Transfer as far as car go up then ski touring to Camp 3 (altitude 4250 m). O/N C3. Day 4: Acclimatization day, ski ascend to higher than Camp 3 (4800-5000 m) and ski down to C3. O/N C3. 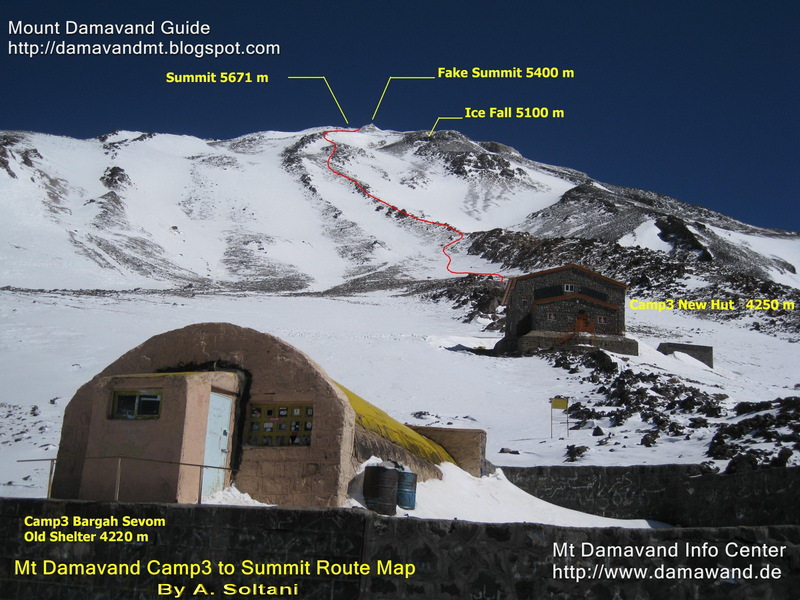 Day 5: Ski mountaineering to Damavand summit (altitude 5671 m) and descend to the Camp 3. O/N C3. Day 6: Ski down to Camp 2 and transfer to Camp 1 and Tehran. O/N hotel. Day 3: Acclimatization day, full day ski touring in Lasem (Doberar, Angemar or Changiz Chale 4000-4300m). O/N C1. Day 4: Transfer as far as car go up then ski touring to Camp 3 (altitude 4250 m). O/N C3. Day 5: Acclimatization day, ski ascend to higher than Camp 3 (4800-5000 m) and ski down to C3. O/N C3. Day 6: Ski mountaineering to Damavand summit (altitude 5671 m) and descend to the Camp 3. O/N C3. Day 7: Ski down to Camp 2 and transfer to Camp 1 and Tehran. O/N hotel. Day 8: Reserved day for bad weather or more acclimatization. O/N C1/C3/hotel. Day 9: Sightseeing Tour. Full day sightseeing tour in Tehran. O/N C1 hotel. Day 10: Departure day. Transfer to the IKA Airport. Fly to your country. Tour ends. damavand, damavand ski itinerary, ski touring program damavand, skitouring plan damavand, iran ski tours, damavand ski, ski mountaineering tour damavand, iran ski expedition schedules, damavand ski resort, damavand snowboard tour, damavand ski 2017, damavand, damavand tour organizer, damavand skitour guide, mt damavand iran.